Oblique tears can be sudden, surprising, and painful. Usually the result of an aggressive twisting motion, this injury can even mimic a rib injury because it's so painful. Those who play rotational sports, such as tennis or golf, might experience an oblique tear. Even if you're simply helping a friend move and lifting heavy furniture awkwardly, you can experience an oblique tear. For some people, injuries like this can be devastating. It can be tempting to ignore the pain and keep exercising, but that can often make the tear worse. The best thing to do is let the injury heal while doing exercises that don't make it worse. If you train intelligently, you can even make some improvements in your fitness while you recover from your injury. Learn more about the injury before planning your workouts. Torn muscles are particularly difficult to deal with. A muscle tear usually feels like a "pop" or stabbing sensation. The muscle tends to swell up and will be painful. If you think you've experienced a muscle tear, you should see a doctor. The diagnosis will involve an examination of the muscle and some questions. You might also need an MRI so that the doctor can see the full extent of the injury. According to the Hospital for Special Surgery, there are three different types, or grades, of muscle tears. The first grade is very small -- only about 5% of the muscle is actually torn. A second-grade tear means that most of the muscle is torn. The third grade means that the muscle is ruptured. A full rupture means that either the muscle itself or the tendon, which connects the muscle to the bone, completely tears. The oblique muscles are the muscles on the side of the rectus abdominis, the famed "six-pack" muscle. There are two oblique muscles, the external oblique, which lies on top, and the internal oblique, which lies underneath. Of the two muscles, the internal oblique has more reported cases of tearing than the external oblique. The motion that causes the oblique to tear involves rotation of the upper body, which is the action that the oblique performs. A case study in the British Journal of Sports Medicine shows that a tennis player suffered an oblique injury from a tennis swing, which is a great example of an upper-body rotational movement. 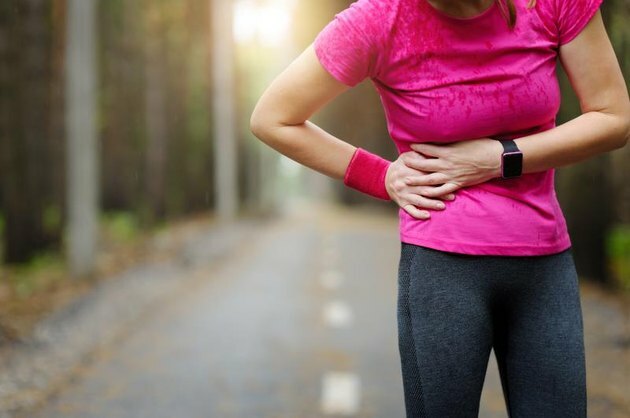 Since oblique tears are usually caused by rotation, that's the first type of movement that you should try to avoid if you're recovering from this injury. Doctor of Physical Therapy and Strength and Conditioning Coach Jon Herting also recommends avoiding the Valsalva maneuver, a breathing technique that involves holding your breath while lifting something heavy. When you perform the Valsalva maneuver your ab muscles tighten around your lungs and torso, creating a lot of pressure in your abdomen. Your obliques automatically tighten when you perform a Valsalva, so it is dangerous if you have an oblique tear. Herting recommends that people suffering from a torn oblique don't limit their motions too much but he does advise against resisted and forceful ab movements. It's also a good idea to avoid exercises with weights or heavy lifting, such as dumbbell and barbell movements because they encourage the Valsalva maneuver, and sports that involve aggressive rotation like tennis, hockey, golf, baseball and even bowling. While recovering from a torn oblique try to focus on bodyweight movements that don't involve too much strain in the abs, like squats, jumps and push-ups. Certain forms of yoga will help you stay active but avoid further injury. Find restorative yoga classes that avoids twisting motions and movements like side-bends which can stress the obliques. When you're figuring out what exercises, you can do, make sure that you avoid exercises that are painful. Pain is a sign that the injury might be getting worse instead of better. Also remember to check with a doctor to make sure your exercise program is safe. Stretching is generally beneficial because it keeps your joints and muscles moving without running the risk of a stressful activity like weight-lifting. You can also perform many forms of cardio, such as swimming, running and bike-riding. Note that during running or swimming, you do rotate your torso slightly so if you feel they aggravate the tear, stop immediately. Can I Exercise With a Hernia? How Many Sit-Ups Should You Do a Day to Lose Weight?